Oh, I've been waiting for this little camera for a long time: A pro-worthy Nikon point-and-shoot. After the bizarre melange of features in Nikon's last flagship camera—uh, ethernet jack?—the P7000 is nakedly all about performance. The P7000 is also quite nakedly, um, inspired by the Canon G-series pro point-and-shoots it's competing against. Not only does it look a lot more like the G11 than it does the P6000, it pulls the same trick of dropping megapixels for better low-light performance: The P6000 had a 14.2MP sensor, while the P7000 has a 10MP CCD sensor. It also drops a lot of the P6000's whizzier features in the process, like built-in GPS geotagging and that ethernet jacking. But if it says anything the ISO range is expandable up to 12,800. Radical in this kind of camera, so Nikon's got some confidence in the sensor's performance. Good. It&apos;s fat. It&apos;s $500. It takes fantastic photographs. On paper, the P7000 outclasses the G11 and looks on par with Panasonic's Lumix LX5. It shoots 720p video at 24fps (and it's got a stereo mic input, which is kind of killer, again, in this kind of camera). It goes for lens flexibility versus straight speed, with a 7.1x zoom 28-200mm F2.8-5.6 lens. What I'm unexpectedly excited about is the optical viewfinder. Missing entirely from the LX5 and practically a shrunken pinhole on the G11, Nikon promises a "large optical viewfinder with diopter adjustment dial." There is a heavy sprinkling of the kinds of fiddly dials photo nerds love, naturally, though I'm not crazy about their arrangement at first glance. And of course, it's got full manual controls, bracketing and shoots RAW (this time, compatible with Macs, too). Right on target, it's $500 when it comes out later this month. MELVILLE, NY (September 8, 2010) – With advanced functions and features similar to those found in Nikon's line of award winning and critically acclaimed D‐SLRs, Nikon Inc. today introduced the COOLPIX P7000, the ultimate compact camera that's ready to take on most any photo assignment. At home in a pro's gadget bag or in the hands of a spirited enthusiast, passionate photographers of all levels will benefit from the P7000's high performance, extensive manual controls, stunning image quality and advanced shooting functions. The 10.1‐megapixel COOLPIX P7000 features a large 1/1.7" CCD sensor coupled with a 7.1x Wide Angle Optical Zoom‐NIKKOR ED Glass Lens for consistent superior image quality that explodes with vivid color and sharpness frame after frame. Taking Nikon's commitment to image quality a step further, the P7000 adopts Nikon's new EXPEED C2TM high performance digital image processing engine to ensure high‐ quality pictures with stunning color and sharpness. "The COOLPIX P7000 represents the best of both worlds. It is an exciting compact camera offering from Nikon, as it not only provides expanded creative control found in digital SLR cameras, but also provides photo enthusiasts with the portability and simplicity of COOLPIX digital cameras," said Bo Kajiwara, director of marketing, Nikon Inc. "The P7000 is the perfect complement to an advanced photographer's D‐SLR, and it inspires the entry‐level consumer to explore the boundaries of their photographic capabilities and fulfill their creative vision." ISO sensitivity ranges from ISO 100 to 6400 (expandable to ISO 12,800 in low noise Night Mode) to ensure incredibly sharp, crisp images when shooting in low‐light or photographing fast‐moving subjects. The P7000 also offers a variety of functions that enable superior rendering when shooting at high sensitivities, including a Low Noise Night Mode and a Noise Reduction Filter. The camera also features 5‐ Way VR Image Stabilization System, which utilizes a variety of tactics including optical lens shift to minimize the effect of camera shake to help banish the blur while shooting handheld or in low‐light. Thoughtful engineering has led to the addition of features that will be welcome to current D‐SLR users. The Zoom Memory function allows the camera's 28‐200mm (35mm equivalent) lens to be used in a way that simulates use of a prime lens, ideal for shooting at a preferred angle of view. The P7000 also adds controls and buttons for key features like ISO, white balance, bracketing and exposure compensation. The new innovative and independent Quick Menu dial ensures easy access to key functions with the comfort of analog operation. Advanced users will also enjoy the benefits of shooting RAW/NRW* files for creative freedom, and macro abilities as close as 0.8 inches. While the image quality of the P7000 is nothing short of stellar, the video capabilities are far beyond that of a typical compact. The P7000 records HD video at 720p at 24 frames‐per‐second (fps) with optical zoom and autofocus control. A COOLPIX first, users can now record audio with an external stereo microphone via the microphone input. An accessory microphone or Nikon Speedlight can be mounted on the P7000's hot shoe. 7.1x Wide‐Angle Optical Zoom‐NIKKOR ED glass lens (28‐200mm f/2.8‐5.6) allows for detailed close‐ups and dramatic landscapes. 3.0‐inch 921,000‐dot Clear Color Display with wide viewing angle makes it easy to compose, view and share still images and movies that come alive with rich detail and improved contrast. Tone Level Information helps photographers achieve their desired exposure with a histogram display, allowing them to determine the exposure while checking the balance between highlights and shadows. Electronic Virtual Horizon Indicator gives the user visual confirmation that the camera has a level horizon. In‐camera editing functions include exposure compensation, COOLPIX Picture Control, noise reduction filter, Quick Retouch, D‐Lighting and Active D‐Lighting. High ISO up to 6400 at full resolution for optimal results when shooting in low‐light or photographing fast‐moving subjects. Best Shot Selector (BSS) automatically takes up to 10 shots while the user presses the shutter and saves the sharpest image. NRW (RAW) file function compatible with Mac® and Windows® Operating Systems. HD (720p) Movie with Stereo, Mic Input Jack and HDMI Output records at 24 fps with optical zoom, autofocus and stereo sound. Subject Tracking automatically activates autofocus while tracking moving subjects, like active children or unpredictable animals. 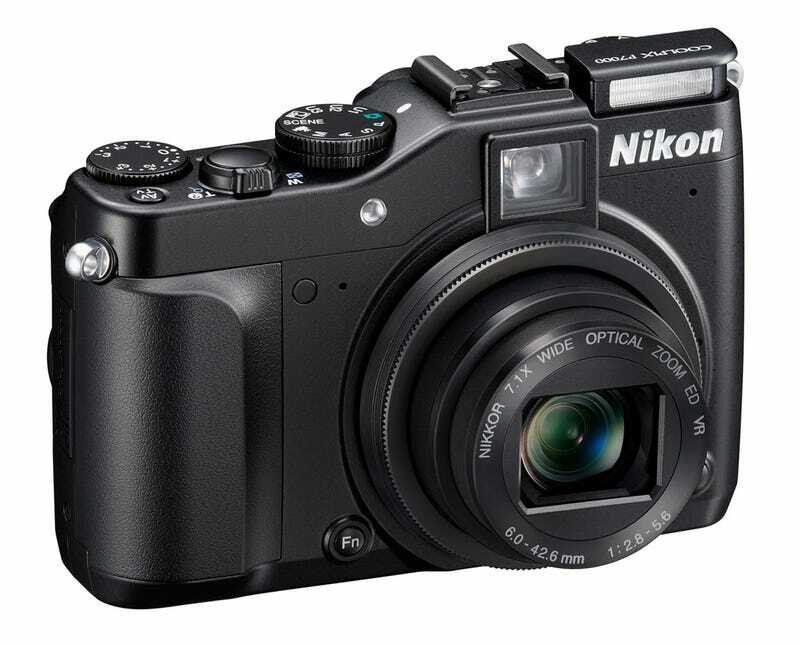 The Nikon COOLPIX P7000 will be available in late September 2010 for $499.95** MSRP.